We would like to draw your attention to this international symposium organized by our cooperation partner Seattle Pacific University (spu.edu). wir möchten Sie auf dieses internationale Symposium aufmerksam machen. Es wird organisiert von unserem Kooperationspartner Seattle Pacific University (spu.edu). Информируем Вас о данном международном симпозиуме , организатором которого выступает наш партнер – Тихоокеанский университет Сиэтла (spu.edu). We would like to invite you to participate in this academic gathering of scholars from around the world. We will meet in the beautiful Pacific Rim city of Seattle, with an afternoon spent on Whidbey Island, off the coast of Washington State. The Symposium is supported by SPU, the School of Education, the Center for Global Curriculum Studies, and grants from the Henry Jackson School of International Studies of the University of Washington. The theme of Educational Innovation resonates increasingly well in our rapidly changing technological age. Traditional assumptions are brought into question, and in some case swept aside. Change affects all levels from pre-school and kindergarten through post-graduate university. Age-old models of teaching and learning are challenged. Access to information moves quickly from centrally-located fixed sources we have taken for granted, including schools, libraries, and universities to web-based sources bound neither by time nor distance. The print medium, five centuries old, gives way to digital sources. Journals change from print to electronic form. These are exciting times to be involved in education. But some things do not change, for example, the need to come together as colleagues to share insights and vision. One of the great collateral outcomes of our many prior symposiums is the creation of lasting friendships among scholars across the globe. As we meet together and form a community over three days’ time, we build a lasting social/moral fabric of dedicated friends who share a common interest in the betterment of educational opportunity for the coming generations. Please register and submit the abstract of your presentation to Stephanie Tichelaar, our Program Manager, at stephmichelle@spu.edu . Your abstract should contain your name and position, paper title, key terms, and no more than 300 words. The deadline for abstracts is March 30th, 2019. Abstracts are reviewed for acceptance in the order in which they are submitted, and applicants will be notified of our decision within one week of our receipt of your submission. Issue 2-2018 of our peer reviewed journal “International Dialogues on Education: Past and Present” has now been online since November 27th, 2018. This issue aims in particular at discussing historical and current developments in pedagogical and social science research and thus literally lives up to its title. The first three articles deal in particular with historical-comparative aspects of education. This is followed by three articles that focus more on current pedagogical and research methodology issues. In a final section you will find reviews of books published in 2018. “International Dialogues on Education: Past and Present” will continue to maintain a broad thematic focus on educational developments from historical, international and comparative perspectives. Furthermore, not only educational scientists and practitioners can exchange information about their research results, but also representatives of related fields in the human and social sciences. We publish articles that are scientifically verifiable, permeated by humanistic, democratic values, social responsibility, respect for autonomy, diversity and the dignity of individuals, groups and communities. Our editorial team stands for liberal, independent educational research and publication activity and against the unrestrained commercialization of access to scientific publications. Despite rising production costs for the further development of the design, the expansion of our globally operating IDE team, etc., the editorial work remains free of charge for the authors. For editorial planning reasons, it is recommended that the provisional titles of the intended contributions for issue 1-2019 be submitted to the Editorial Board as early as possible, but no later than 15 March 2019. The deadline for sending the complete articles is 15 April 2019. We look forward to further high-quality contributions: articles, essays, book reviews, conference reports and information on research and teaching projects. The present issue is online since February 26, 2017. It is the second part of a series of articles the journal has been commissioned to publish on behalf of the „International Academy for the Humanization of Education“ (IAHE). Both parts include contributions from the international conference of the IAHE, which took place at the University of Hildesheim (Germany) in September 2016. They deal with outcomes of projects supported by the TEMPUS-Program of the European Union—including their publication in our journali—and they are dedicated to the themes of “Diversity and Democracy—the Search for Identity in Uncertain Times”. Based on an international peer-review process, the guest editors, Prof. Dr. Dr. h.c. Olga Graumann (University of Hildesheim) and Prof. Dr. Evgeniy V. Ivanov (State University of Novgorod, Russia), have selected for publication submissions from Russia, Belarus, Latvia, Austria, Canada, USA, Ukraine, Switzerland and Germany. We thank the guest editors, authors, and reviewers for their constructive cooperation. We are also grateful to all those who have helped us with translations, as well as formal organizational and technical tasks, among them Dr. Oleg Zayakin, Maria Demina and Madelaine Saalmann. We are continuing with our wide thematic orientation toward educational developments from historical or international-comparative and intercultural perspectives. Please send the titles for contributions for issue 3-2017 by July 31, and the complete paper by August 31, 2017. Instructions are available at Instructions to contributors. настоящее издание находится с 26-го февраля 2017 г. в режиме онлайн. Это вторая часть серии статей, которую мы публикуем по поручению «Международной Академии гуманизации образования» (МАГО). Обе части включают в себя статьи с международной конференции МАГО, которая состоялась в сентябре 2016 года в университете г. Гильдесгейм (Германия). Речь идет о результатах проектов, которые – включая их публикацию в нашем журналеii – были поддержаны программой Европейского Союза «Темпус» и посвящены теме «Многообразие и демократия – поиск идентичности в сложные времена». Редакторы данного специального издания, госпожа проф. др. почетный др. Ольга Грауманн (угиверситет г. Гильдесгейм) и господин проф. др. Евгений В. Иванов (Новгородский государственный университет, Россия), выбрали для публикации согласно международному методу экспертизы статей из России, Белоруссии, Латвии, Австрии, Канады, США, Украины, Швейцарии и Германии. Мы благодарим редакторов специального издания, авторов, экспертов за конструктивное сотрудничество. Наша благодарность касается всех, кто поддерживал нас в вопросах перевода, в формальных и технических работах, в частности др. Олега Заякина, Марию Демину, и Маделен Залманн. Мы сохраняем нашу широкую тематику, ориентированную на развитие образования в исторической или международно-сравнительной и поликультурной перспективе. Мы просим присылать название статей для номера 3-2017 до 31-го июля и готовые статьи до 31-го августа 2017-го года. Указания Вы найдете по адресу Instructions to contributors. Мы будем рады высококачественным статьям, очеркам и рецензиям на книги! die vorliegende Ausgabe ist online seit dem 26. Februar 2017. Es ist der zweite Teil einer Artikelserie, die wir im Auftrag der „International Academy für the Humanization of Education“ (IAHE) veröffentlichen. Beide Teile enthalten Beiträge zu einer internationalen Konferenz der IAHE, die im September 2016 an der Universität Hildesheim (Deutschland) stattfand. Es handelt sich um Ergebnisse von Projekten, die – einschließlich ihrer Veröffentlichung in unserem Journaliii – vom Tempus-Programm der Europäischen Union unterstützt wurden und sich der Thematik „Vielfalt und Demokratie – Identitätssuche in unübersichtlichen Zeiten“ widmen. Die Gastherausgeber, Frau Prof. Dr. Dr. h.c. Olga Graumann (Universität Hildesheim) und Herr Prof. Dr. Evgeniy V. Ivanov (Staatliche Universität Novgorod, Russland), haben nach einem internationalen peer review Verfahren Beiträge aus Russland, Weißrussland, Lettland, Österreich, Kanada, den USA, der Ukraine, der Schweiz und Deutschland ausgewählt. Wir bedanken uns bei den Gastherausgebern, den Autorinnen und Autoren, den Gutachterinnen und Gutachtern für die konstruktive Kooperation. Unser Dank gilt auch allen, die uns durch Übersetzungen, formale und technische Arbeiten unterstützt haben, darunter Dr. Oleg Zayakin, Maria Demina und Madelaine Saalmann. Wir behalten unsere weite thematische Orientierung auf Bildungsentwicklungen in historischer, oder international-vergleichender und interkultureller Perspektive bei. Wir bitten um Zusendung der Titel der Beiträge bis zum 31. Juli und den kompletten Beitrag bis zum 31. August, 2017. Redaktionelle Hinweise finden Sie in: Instructions to contributors. Wir freuen uns auf weitere hochwertige Artikel, Essays und Buchbesprechungen! i This publication has been funded with support from the European Commission. It reflects only the views of the authors, and the Commission cannot be held responsible for any further use of the information contained therein. ii Публикация финансируется при поддержке Европейской Комиссии. Содержание данной публикации является предметом ответственности авторов и не отражает точку зрения Европейской Комиссии. iii Diese Publikation wurde mit Unterstützung der Europäischen Kommission finanziert. Die Verantwortung für den Inhalt der Artikel tragen allein die Verfasser; die Kommission haftet nicht für die weitere Verwendung der darin enthaltenen Angaben. The present issue is online since December 22, 2016. It is the first part of a series of articles the journal has been commissioned to publish on behalf of the „International Academy for the Humanization of Education“ (IAHE). The second part will be published at the end of February 2017 (IDE 1-2017). Both parts include contributions from the international conference of the IAHE, which took place at the University of Hildesheim (Germany) in September 2016. They deal with outcomes of projects supported by the TEMPUS-Program of the European Union—including their publication in our journali—and they are dedicated to the themes of “Diversity and Democracy—the Search for Identity in Uncertain Times”. Based on an international peer-review process, the guest editors, Prof. Dr. Dr. h.c. Olga Graumann (University of Hildesheim) and Prof. Dr. Evgeniy V. Ivanov (State University of Novgorod, Russia), have selected for publication submissions from Russia, Belarus, Latvia, Austria, Canada, USA, Ukraine, Switzerland and Germany. We thank the guest editors, authors, and reviewers for their constructive cooperation. We are also grateful to all those who have helped us with translations, as well as formal organizational and technical tasks, among them Dr. Oleg Zayakin, Verena Walterbach, and Maria Demina. Based on current interests we are continuing with our wide thematic orientation toward educational developments from historical or international-comparative and intercultural perspectives and continue to look forward to high-quality articles, essays, and book reviews! настоящее издание находится с 22-го декабря в режиме онлайн. Это первая часть серии статей, которую мы публикуем по поручению «Международной Академии гуманизации образования» (МАГО), и вторая часть которой появится в конце февраля 2017 года (IDE 1-2017). Обе части включают в себя статьи с международной конференции МАГО, которая состоялась в сентябре 2016 года в университете г. Гильдесгейм (Германия). Речь идет о результатах проектов, которые – включая их публикацию в нашем журналеii – были поддержаны программой Европейского Союза «Темпус» и посвящены теме «Многообразие и демократия – поиск идентичности в сложные времена». Редакторы данного специального издания, госпожа проф. др. почетный др. Ольга Грауманн (угиверситет г. Гильдесгейм) и господин проф. др. Евгений В. Иванов (Новгородский государственный университет, Россия), выбрали для публикации согласно международному методу экспертизы 48 из 60 поданных статей из России, Белоруссии, Латвии, Австрии, Канады, США, Украины, Швейцарии и Германии. Мы благодарим редакторов специального издания, авторов, экспертов за конструктивное сотрудничество. Наша благодарность касается всех, кто поддерживал нас в вопросах перевода, в формальных и технических работах, в частности др. Олега Заякина, Верену Вальтербах, Марию Демину и других. Мы сохраняем нашу широкую тематику, ориентированную на развитие образования в исторической или международно-сравнительной и поликультурной перспективе и будем рады высококачественным статьям, очеркам и рецензиям на книги! die vorliegende Ausgabe ist online seit dem 22. Dezember 2016. Es ist der erste Teil einer Artikelserie, die wir im Auftrag der „International Academy für the Humanization of Education“ (IAHE) veröffentlichen, und deren zweiter Teil Ende Februar 2017 erscheint (IDE 1-2017). Beide Teile enthalten Beiträge zu einer internationalen Konferenz der IAHE, die im September 2016 an der Universität Hildesheim (Deutschland) stattfand. Es handelt sich um Ergebnisse von Projekten, die – einschließlich ihrer Veröffentlichung in unserem Journaliii – vom Tempus-Programm der Europäischen Union unterstützt wurden und sich der Thematik „Vielfalt und Demokratie – Identitätssuche in unübersichtlichen Zeiten“ widmen. Die Gastherausgeber, Frau Prof. Dr. Dr. h.c. Olga Graumann (Universität Hildesheim) und Herr Prof. Dr. Evgeniy V. Ivanov (Staatliche Universität Novgorod, Russland), haben nach einem internationalen peer review Verfahren Beiträge aus Russland, Weißrussland, Lettland, Österreich, Kanada, den USA, der Ukraine, der Schweiz und Deutschland ausgewählt. Wir bedanken uns bei den Gastherausgebern, den Autorinnen und Autoren, den Gutachterinnen und Gutachtern für die konstruktive Kooperation. Unser Dank gilt auch allen, die uns durch Übersetzungen, formale und technische Arbeiten unterstützt haben, darunter Dr. Oleg Zayakin, Verena Walterbach, Maria Demina und andere. Wir behalten unsere weite thematische Orientierung auf Bildungsentwicklungen in historischer, oder international-vergleichender und interkultureller Perspektive bei und freuen uns auf weitere hochwertige Artikel, Essays und Buchbesprechungen! Die in den Endnoten angeführten Hinweise zur Verantwortung von Autorinnen und Autoren beziehen sich konkret nur auf die vorliegende Ausgabe; sie sind aber von genereller Bedeutung. Dies wollen wir auch im Kontext einer kontroversen Diskussion über Genderstudien in „Scienceblogs“ (http://scienceblogs.de/) anmerken. Der Blogger und Gesundheitswissenschaftler Joseph Kuhn berichtet darin, wie einzelne Beteiligte sich in ihrer Polemik im Ton vergriffen hätten und bezieht dies auf Markus D. Meier (Universidad Externado de Colombia, Bogotá), von dem ein Artikel in unserem Journal erschienen war. In diesem Kontext betonen wir nochmals, dass auch die IDE-Autorinnen und -Autoren für die Inhalte ihrer Artikel verantwortlich sind. Polemisierende, polarisierende und theoretisch substanzlose Diskussionen dürfen nicht an die Stelle wissenschaftlicher Auseinandersetzungen treten.Die Genderthematik wird zwar auch weiterhin nicht in unserem Fokus stehen. Unser Journal ist aber offen für diesbezügliche, von diskreditierender Polemik freie Beiträge, gegebenenfalls auch im Kontext einer diskursanalytischen, methodenkritischen Diskussion. 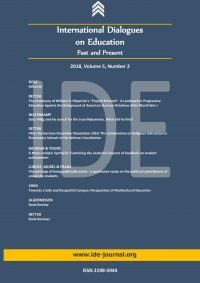 The new issue (Volume 3, 2016, Number 2) of our online journal „International Dialogues on Education: Past and Present“ (IDE) is online since September 8, 2016. In this issue you will find seven articles and three reviews. The contribution by Anja and Dietrich-Eckhard Franz (Germany) focuses on the positions and activities of the German theologian and precursor of the Enlightenment, Johann Valentin Andreae (1586-1654). Hein Retter (Germany) develops a distinctly critical perspective on the work of the classic scholar of American pedagogy John Dewey, world-renowned co-founder of pragmatism and influential to this day. On the 100th anniversary of the publication of Dewey’s “Democracy and Education” (1916) he illuminates Dewey’s positions on religion, tolerance and racism. Gábor B. Albert (Hungary) describes the phases of textbook revisions and discussions of the 1928 Oslo conference of historians, organized by the International Committee of Historians. The article by Vladimir A. Sakhrokov (Russia) provides information about existentialism and modern world civilization through the example of current Russian discussions on existentialist philosophy, with a focus on conceptual characteristics of coexistence in a seemingly safe contemporary world. Brendan Ngeloo Abamukong (Cameroon, currently The Netherlands) illuminates the effects of gender and spatial differences on schooling decisions in the developing country of Cameroon from a socio-cultural perspective. Karin Manns (USA) compares educational-policy and pedagogical reforms in Finland with respective ones in Washington State (USA) and specifically highlights the Finnish results in international testing comparisons. Markus Meier und Manuel Páez (Columbia) deal with the role of education in peace building in the context of Columbian social conflicts after violent activities. They analyze possible pragmatic and legalistic solutions for post-conflict phases along with the “buffer role” which education can assume. The issue closes with reviews by three German reviewers introducing books published between 2014 and 2016: Natascha Hofmann reviews Hildegard Wenzler-Cremer’s book “Studierende und Kinder lernen voneinander …”, Bruno Köhler the book „Lernen und Geschlecht heute …“ by Markus Maier, and Reinhard Golz the book „The Schooled Society“ by David Baker. Sincere appreciation is due to all those who made the publication of this issue possible through contributions, appraisals, translations, editorial and electronic-technical work. In view of the existing interests, for the next issues we will keep with the wide range of thematic orientation towards educational developments from historical, or international-comparative and intercultural perspectives and look forward to further high-quality manuscripts. новый номер (Выпуск 3, 2016 г., 2) электронного журнала «Интернациональные диалоги в образовании: прошлое и настоящее“ с 8-го сентября 2016 года находится в онлайн-доступе. В этом выпуске вы найдете семь статей и три рецензии книг. В центре статьи Ани и Дитрих-Экхарда Франц (Германия) находятся воззрения и деятельность немецкого теолога и предвестника эпохи Просвещения Иоганна Валентина Андреа (1586-1654). Хейн Реттер (Германия) развивает подчеркнуто критическую точку зрения в отношении творчества классика американской педагогики, всемирно известного и до сих пор влиятельного, одного из основателей прагматизма. В год столетнего юбилея со дня появления книги Дьюи «Демократия и воспитание» (1916) он освещает его позиции относительно толерантности и религии. Габор Б. Альберт (Венгрия) описывает фазы ревизии учебников и дебаты на конференции историков в Осло в 1928 году, организованную Международным комитетом историков. Статья Владимира А. Сахрокова (Россия) информирует об экзистенциализме и современной мировой цивилизации на примере современных российских дискуссий об экзистенциалистской философии, с акцентом на концептуальные признаки сосуществования современного и предположительно идеального мира. Брендан Нгелоо Абамуконг (Камерун, в настоящее время Нидерланды) освещает с социо-культурной точки зрения влияния гендерных и территориальных различий на образовательные решения в развивающейся стране Камерун. Карин Маннс (США) сравнивает образовательно-политические и педагогические реформы в Финляндии с реформами в штате Вашингтон (США) и подчеркивает, в частности, финские результаты в международных образовательных конкурсах. Маркус Д. Мейер и Мануель Паес (Колумбия) занимаются ролью образования для достижения мира в контексте колумбийских общественных конфликтов после завершения насильственного противостояния. Анализируются прагматические и легальные концепции в фазах пост-конфликта, а также «роль буфера», которую может взять на себя образование. В заключении три немецких рецензента представляют книги, которые появились между 2014 и 2016 годами: Наташа Хофманн рецензирует книгу Хильдегарда Венцлер-Кремерса «Студенты и дети учатся друг у друга …», Бруно Келер книгу «Учение и гендер сегодня …» Маркуса Мейера и Рейнхард Гольц Книгу «The Schooled Society» Давида Бейкера. Огромное спасибо всем, кто своими статьями, рецензиями, переводами, редакционными и интернет-техническими работами способствовали публикации данного номера. Ввиду актуального интереса мы сохраняем для следующего номера широкую тематическую ориентацию на развитие образования в историческом, международно-сравнительном и межкультурном направлении и будем рады дальнейщим высококачественным рукописям. die neue Ausgabe (Jg. 3, 2016, Nr. 2) unserer Online-Zeitschrift “Internationale Dialogues on Education: Past and Present” (IDE) ist online seit dem 8. September 2016. In dieser Ausgabe finden Sie sieben Artikel und drei Rezensionen. Im Zentrum des Beitrages von Anja und Dietrich-Eckhard Franz (Deutschland) stehen Positionen und Aktivitäten des deutschen Theologen und Vorboten der Aufklärung, Johann Valentin Andreae (1586-1654). Hein Retter (Deutschland) entwickelt eine betont kritische Sicht auf das Werk des Klassikers der amerikanischen Pädagogik, weltbekannten und bis heute einflussreichen Mitbegründers des Pragmatismus). Im 100. Jahr des Erscheinens von Deweys „Demokratie und Erziehung“ (1916) beleuchtet er dessen Positionen zu Religion, Toleranz und Rassismus. Gábor B. Albert (Ungarn) beschreibt Phasen der Lehrbuchrevision und Debatten der Historikerkonferenz in Oslo 1928, organisiert vom Internationalen Historikerkomitee. Der Artikel von Vladimir A. Sakhrokov (Russland) informiert über den Existentialismus und die moderne Weltzivilisation am Beispiel aktueller russischer Diskussionen über die existentialistische Philosophie, mit einem Schwerpunkt auf konzeptionelle Merkmale der Koexistenz in einer modernen und vermeintlich heilen Welt. Brendan Ngeloo Abamukong (Kamerun, z.Zt. Niederlande) beleuchtet aus soziokultureller Sicht Wirkungen von Gender- und räumlichen Unterschieden auf Bildungsentscheidungen im Entwicklungsland Kamerun. Karin Manns (USA) vergleicht bildungspolitische und pädagogische Reformen in Finnland mit denjenigen in Washington State (USA) und hebt insbesondere die finnischen Ergebnisse in internationalen Leistungsvergleichen hervor. Markus Meier und Manuel Páez (Kolumbien) befassen sich mit der Rolle der Bildung für die Friedensförderung im Kontext der kolumbianischen gesellschaftlichen Konflikte nach Beendigung gewaltsamer Auseinandersetzungen. Analysiert werden pragmatische und legalistische Lösungsansätze zu den Post-Konflikt-Phasen sowie die “Puffer-Rolle”, die die Bildung einnehmen kann. Abschließend stellen drei deutsche Rezensenten Bücher vor, die zwischen 2014 und 2016 erschienen sind: Natascha Hofmann rezensiert Hildegard Wenzler-Cremers Buch “Studierende und Kinder lernen voneinander …”, Bruno Köhler das Buch „Lernen und Geschlecht heute …“ von Markus Meier und Reinhard Golz das Buch „The Schooled Society“ von David Baker. Die Editoren danken allen, die durch Beiträge, Gutachten, Übersetzungen, redaktionelle und internet-technische Arbeiten die Veröffentlichung dieser Ausgabe ermöglichten. Angesichts der aktuellen Interessenlage behalten wir auch für die nächsten Ausgaben die weite thematische Orientierung auf Bildungsentwicklungen in historischer, oder international-vergleichender und interkultureller Perspektive bei und freuen uns auf weitere hochwertige Manuskripte.